Tired of the same old on-off, on-off action? Learn the power of PWM! This is our first introduction to PWM! Read on to find out about this powerful technique. 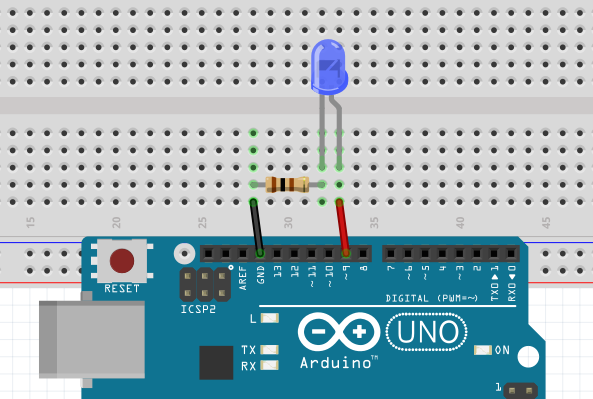 We're going to use the same LED/resistor setup as the Blink sketch – with one important difference: the LED should be attached to pin 9, or any other pin with a little tilde (~) mark next to it. You can put the resistor on either side of the LED. Now, guess what? We're using an ANALOG function to write to a DIGITAL pin! The 0-255 brightness value (that's 2^8) is translated into switching the pin on and off, too fast for the eye to see. At a value of 127 (50% brightness), the LED will be on 50% of the time, off 50% of the time. And the actual length of those pulses gives PWM – pulse width modulation – its name. Next, add 5 brightness points (fadeAmount ), wait 30 milliseconds, and restart the loop. At this rate, the LED will reach full brightness in about a second and a half. However, if we've hit max brightness, we also flip the sign of fadeAmount so that it's negative – fading back down to zero, -5 at a time, until it's completely off again. The || in the code signifies "or". Modify the "fadeAmount" value to make the effect faster or slower. Make sure to plug your LED into pin 9, or any other PWM pin (as long as it matches the code). The little tilde marks on the Arduino show you which pins will work.